Just last Thursday Google announced the Chromecast, a $35 device meant to facilitate streaming content to your TV. When I ordered mine, I was told the expected ship date was August 11th, so I was surprised when my order showed up on my doorstep on July 29th. While I'm certainly not complaining about getting my Chromecast early, suspicious minds might wonder if demand was really as strong as Google was making it out to be in those early hours. The HDMI extension is used either in cases where the Chromecast itself is too thick to fit, or in order to position it to get a better WiFi signal. You might find that you have better results if you use the extension and place the Chromecast on top of, rather than behind, your TV for example. For me the most easily accessible port in my living room setup was on the A/V receiver and I just ran the cord to the power strip. When you turn on the TV you'll be directed to head to www.google.com/chromecast/setup. You need to do this on a device that has WiFi (some of us are still using desktop machines with no wireless adapter) and just to be stubborn I decided to use an iPad running Chrome. 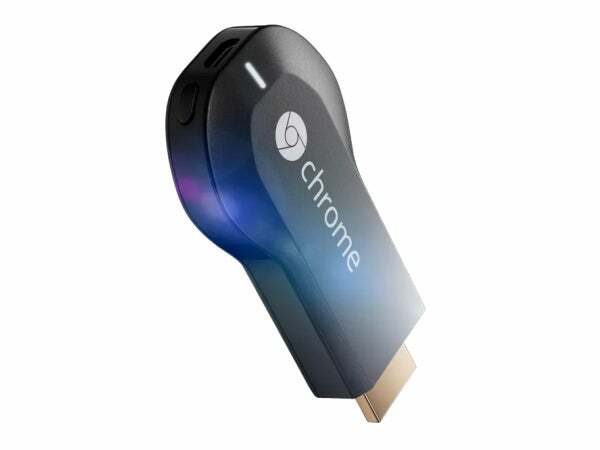 (Once the Chromecast is setup you can control it via a PC with only a wired connection.) You'll follow a few quick steps that involve switching from your home WiFi to the Chromecast's WiFi for a moment, just to get things set up, then switching back. For me that was pretty much the only action I had to take, otherwise it was a Next, Next, Next process. Once you're all set up your TV will have a nice wallpaper along with the name of your Chromecast (you get to name it during setup) and the WiFi network it is connected to, as well as the current time. Now we're ready to cast to it. There are two ways to do this. The best way is to use supported "apps" (and I put that in quotes because it applies to the PC as well as your mobile devices). Currently that means YouTube, Netflix and Google Play media. I had to fiddle around a little bit with some of these the first time I tried them. Netflix on my iPad wouldn't 'see' the Chromecast until I reset it (even though it was up to date). There's a Chromecast app on Android that seemed to be required before I got Netflix working from my phone. YouTube just worked. And once I installed the Chromecast extension in Chrome on my browser, everything just worked there. All these minor issues were 'first run only' problems. It should be noted that you need to be running Chrome on your PC. As far as I could tell there was no way to stream YouTube to the Chromecast if I was running it in Firefox on the PC, for instance. All of these experiences were good once they got up and running. My understanding is that when you stream YouTube, Netflix or Google Play content to the Chromecast, you're basically handing off streaming duties to the device so it'll perform pretty much the same as a Roku, Apple TV or game console would. That was my experience anyway. So I said there were two ways to stream to the Chromecast. The second way is via Chrome browser tabs. This only works on computers and Chromebooks (Google says only the Chromebook Pixel is supported, but it worked on my Acer Chromebook). Basically this method of streaming mirrors a Chrome tab onto the TV. That means, technically, that you can stream Vimeo, Twitch.TV, Pandora music or basically anything that runs in a browser tab. There are some major caveats though. First, apparently your device is working as a kind of middle man between the Internet and your TV. My experience was much better when I used my gaming PC than when I used my Chromebook. Second, what you see is pretty literally a copy of the browser tab, so you won't get full screen content on the TV. If you start the stream on your browser and maximize it, the feed on the TV goes dark, at least on the sites I tried it with. Really I feel that casting via a web tab is more a novelty than anything (though HBO Go would be a pretty good fit if I could get the audio to work, since it has such a nice web interface). Tab sharing would definitely come in handy if you wanted to share your screen with the room, and there is experimental support for sharing your whole screen, which could make the Chromecast useful in meeting rooms. No more fiddling with a projector? Sounds good to me. But the bottom line is that, for now at least, the Chromecast is a $35 device that currently lets you stream YouTube, Netflix and Google Play media to your TV nicely, and stream other sources to your TV less nicely. Is it worth it? That probably depends on what you already own and what you spend a lot of time watching. $35 isn't a lot of money. Plus already we're seeing rumors and rumblings of more support. Vimeo, Redbox and HBO are all rumored to be working on support for the Chromecast. If Google keeps selling them like it (apparently) has been we can expect support to continue to grow and improve. On the other hand Google TV sounded great when it first launched and it's kind of withering on the vine. The nice thing about Chromecast is that the investment is so small, it's probably worth the risk.